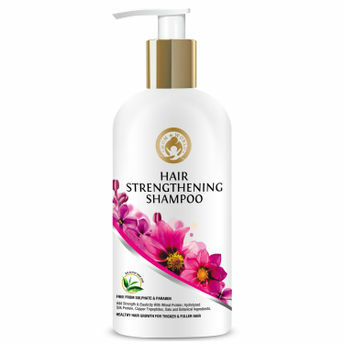 Mom & World Hair Strengthening Shampoo is made using the finest natural and organic ingredients from around the world, like argan oil, jojoba oil, olive oil and blend of proteins. This shampoo provides all the vitamins, amino acids and nutrients your hair and scalp that it needs to heal and grow. Restoring these amino acids and proteins to your hair helps to repair fibers, restore natural moisture and treat split ends. It restores, moisturises, strengthens and cleanses hair in one easy step. This proven formula of natural nourishing oils, vitamins and botanicals is moisturising and volumising and includes a blend of argan oil of Morocco, almond oil, jojoba oil, olive oil, and grapeseed oil. This gentle, sulfate free shampoo is perfect for all hair types including color treated hair. It is perfect for daily use for men, women and teens. It is free from paraben, sulfate and silicon which makes it suitable for all types of hair including colored hair. This means, your scalp will finally be free from irritation and daily damage, allowing it to recover and become healthy once again.